Well, it 'looks' that way. But even at first glance, she doesn't look right. The legs look strangely too straight. ...that the woman's right leg is not a leg at all but is actually the upward extension of the aluminium cladding from the floor below. It perfectly aligns with it and is the same width and colour. There is no woman there. Last edited by Pyrrho on Fri Oct 14, 2016 10:36 am, edited 1 time in total. Reason: Reduced certain links to plain text because they are possibly carrying malware. The photos could have fooled me. Still look all womany to me. It does, but what are the chances that both shots were taken at the exact same time (there seems to have been no movement, no change in posture at all) and the "figure's legs" got fatter in a snap? scrmbldggs wrote: It does, but what are the chances that both shots were taken at the exact same time (there seems to have been no movement, no change in posture at all) and the "figure's legs" got fatter in a snap? She's thinking about Krispy Kreme donuts? What about something like this image? Could one or both have been modified for conspiratorial purposes? I dunno. My question would be, why couldn't someone have survived the initial impact and then gone to the opening to wave for help? Oh wow, those look like real movement. In the others, it seems the legs are simply taken from different angels and hadn't really moved. It's very different here. Along with all else about the upper body... it could still be debris flapping up and down, but it looks awfully real. Last edited by Pyrrho on Sat Oct 15, 2016 2:26 pm, edited 1 time in total. Reason: Link is to a page that allegedly contained malware. scrmbldggs wrote: Oh wow, those look like real movement. In the others, it seems the legs are simply taken from different angels and hadn't really moved. It's very different here. Along with all else about the upper body... it could still be debris flapping up and down, but it looks awfully real. Too bad she just got the legs. If she'd gotten the wings too, she could have flapped her way out of there! It would help if this woman would now come forward and identify herself. Afterall, what does she have to lose? Yeah, don't trust those videos. People falling could be anyone. In fact, some of the videos of people falling incorporate video that isn't even from 9/11. There's one that uses footage from a Hollywood movie. 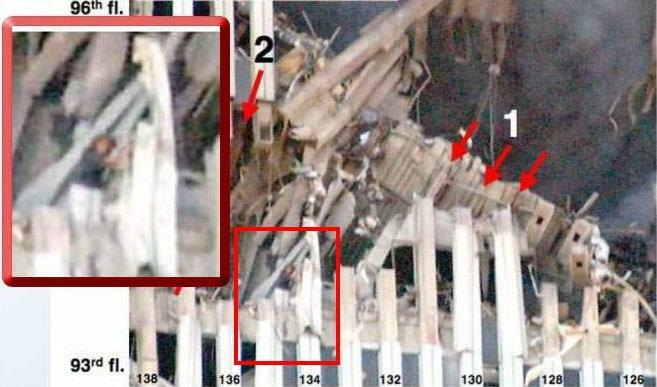 scrmbldggs wrote: Also, what looks like legs in this image (same as posted above) is seems to be sitting on top of the large horizontal beam/floor and not in front like all the other broken vertical ones. Compare the level of "her head" with the white pillar. It looks like "she" may have been kneeling in one of the images. If you look at the location of the "head" and the "hand" in relationship to that broken off piece and missing chunk (that makes the piece look more curved) "she is touching", but also observe the three shorter beams in the background above the hole (one with a rectangular mortise), you can see that the difference in angle (lol) is actually quite substantial. The OP was reported because someone got a phishing attack alert. I have set certain links in the OP to plain text because they are possibly carrying malware. Access them at your own risk. Hmm. Post 10,000. At least it was for something useful. Whatever did we do to upset the fairies? My "brain" quickly and incorrectly, told me there were three workers in the photo. 1) A worker in a yellow safety helmet holding a motor board of plaster, working behind a pole. I think it comes back to the time Pyrrho showed us a video of white noise and all our "brains" tried to make patterns out of random "TV snow". It's obviously an evolved behavioural trade off "thingy" where we immediately make a subconscious conclusion based on too little information, so as we can react quickly. If I walk into a room full of strangers, my brain does the same thing identifying other people's behaviour, also based on too little information. "That tall woman is with the bloke in the hat" "That male is in a threatening pose" "That female is shy". I know it sounds stupid, but I think studying a couple magic tricks and the required misdirection, is sort of a good way to teach humans how to understand not to reach immediate conclusions on too little. I can certainly understand why people like Mr Randi, Harry Houdini and Penn & Teller are good teachers within the skeptic movement. Ha, I see another woman (a smaller twin in white sneakers, no less, looking and pointing to our left) standing in the middle circle. Matthew Ellard wrote: If I walk into a room full of strangers, my brain does the same thing identifying other people's behaviour, also based on too little information. "That tall woman is with the bloke in the hat" "That male is in a threatening pose" "That female is shy". You're weird. I walk into a room full of strangers, my brain asks, "Where's the bar? Where's the bathroom? Where's someplace to sit? Where are the designated fire exits?" Gord wrote: You're weird. I walk into a room full of strangers, my brain asks, "Where's the bar? Where's the bathroom? Where's someplace to sit? Where are the designated fire exits?" I suffer just a tiny bit of agoraphobia, when it comes to large numbers of people, simply because my brain can't "assess" everyone for threats and weaknesses. Gord wrote: Where are the designated fire exits?" Doesn't matter. They'll all be following me. The thing everyone invariably misses is THIS photo....which absolutely clearly shows that the woman's 'legs' are no more than an upward extension of the white aluminium cladding from the floor below. It has to surely be way beyond coincidence that two white covered 'legs' of the woman just happen to be EXACTLY the same width and position and alignment as one of the pairs of such cladding coming up from the floor below. Cygnus_X1 wrote: The thing everyone invariably misses is THIS photo....which absolutely clearly shows that the woman's 'legs' are no more than an upward extension of the white aluminium cladding from the floor below. It has to surely be way beyond coincidence that two white covered 'legs' of the woman just happen to be EXACTLY the same width and position and alignment as one of the pairs of such cladding coming up from the floor below. Did you read Pyrrho's post about the links? Pyrrho wrote: The OP was reported because someone got a phishing attack alert. I don't agree. It could very well be a coincidence, and I don't think they are the exact width and position and alignment of the cladding. That's why I looked for images from other angles. I'm suspicious of all the photos and don't trust any of them in this day and age of image manipulation. I need more information about the trustworthiness of the photos. Also, I don't see why someone couldn't have survived the initial impact, then moved to the hole to wave for help. 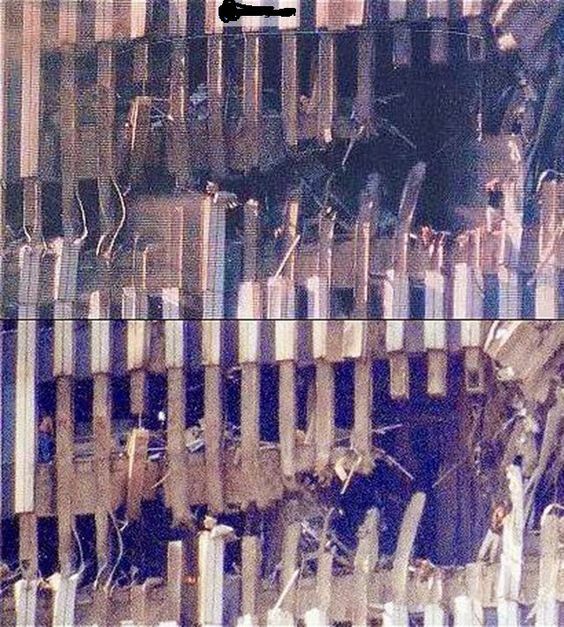 Part of the arguments from both sides seems to make the claim that it couldn't possibly have been a living person if the "story" of 9/11 were true (the plane hitting the tower, etc.). If I remove that premise from consideration, and also ignore my doubts about the trustworthiness of possibly doctored photos, I don't see why anyone can confidently state that the images don't show a woman. The images do show a woman - be she live, nasty, a mannequin, or imaginary. Since so far at least, nobody has claimed they show a bear, goat, pig, or bad hombre, I`ll conclude that `yall agree that they show a woman. TJrandom wrote: Since so far at least, nobody has claimed they show a bear, goat, pig, or bad hombre, I`ll conclude that `yall agree that they show a woman. Cygnus_XI is making the case that it's pareidolia, and there is not actual woman. It's just an illusion. Cygnus_XI is making the case that it's pareidolia, and there is not actual woman. It's just an illusion of a woman. No, you got it wrong. I'll fix it myself. Cygnus_XI is making the case that it's pareidolia, and there is no actual woman. It's just an illusion. Pareidolia... an odd name for a woman. Oh, and like "Gord" is a perfectly normal thing to call a man! Gord wrote: Oh, and like "Gord" is a perfectly normal thing to call a man!